I’ve got a beautiful Autumn soup recipe to share. It’s filled with meltingly tender butternut squash, silky swiss chard, hearty pinto beans, a little zip of chili powder and lime. 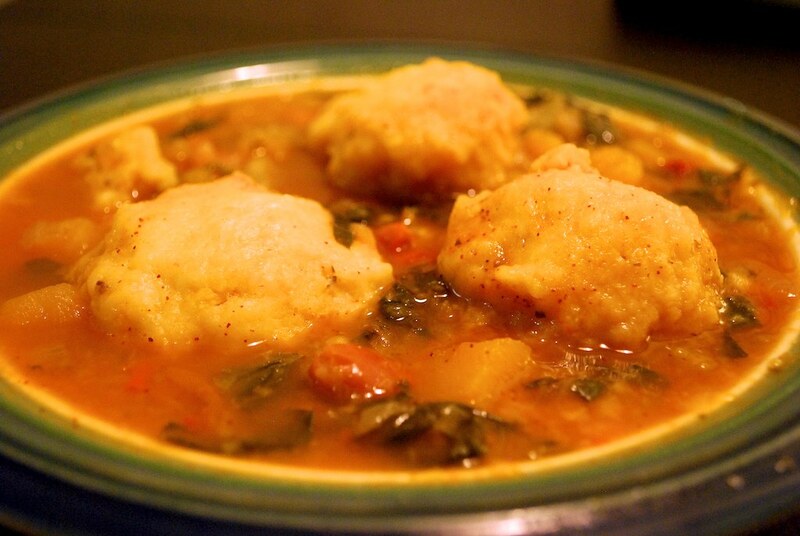 Topped with cornmeal dumplings that steam right in the pot with the stew, it’s a perfect one pot meal. I think you’ll like it. It’s been a crazy busy, pressured week/month/season at work for me. My eyelids are a bit droopy as I write this. The craziness lately has gotten me thinking a bit about why I cook. I could have Thai food delivered. Or buy frozen soy cheese ravioli dinners. Or get great take-out sandwiches from the vegetarian food truck in my neighborhood. And occasionally, I do just that. But most nights, even when things are busy, I find myself drawn back into my kitchen. There is something therapeutic to me about cooking. I particularly like the first steps–entering the kitchen, chopping an onion. I take out my trusty cutting board and favorite super-sharp chef’s knife. Slice the onion in half, and then make the cross-hatch cuts that will give me a beautiful dice every time. Warm some oil on the stove and in minutes our whole apartment is enveloped in the most wonderful smell in the world: frying onions. Preparing the onion gives me a sense of connection: to the earth on the farm in Central Massachusetts where this sweet onion was grown; to the dear friends who gave me the the perfectly weighted, sharp knife; to my husband who bought that trusty cast iron skillet for his first apartment; to my parents who ensured that the smell of frying onions would make almost any place feel like home. Over thirty minutes, or an hour, a meal will come together. Always something nourishing, usually something delicious. A satisfying something to eat for dinner. I recently read this article about Roger Ebert, and how he is writing a cookbook, even though he can no longer eat since cancer took his lower jaw. It made me think about how that eating really is not the most important thing to me about cooking. Eating is wonderful, but I think I understand why Mr. Ebert still cooks. Maybe he cooks for that feeling of connection, of accomplishment. For the reassuring reminder that every time you chop an onion and put it warm oil, your kitchen can smell like the most welcoming home on the planet. I hope you have the chance to make this soup. And, if you do, I hope you enjoy the process of making the soup as much as the soup itself. It is the perfect soup for fall, featuring the three sister crops that were the Native American harvest staples: corn, squash, and beans. I made a huge pot of this for my whole extended family last year around Thanksgiving and it was a big hit with everyone: vegans and omnivores, children and grandparents. 1. In the widest stock pot you have, heat the oil on medium-low heat. Soften the onions, garlic, and peppers for 15 minutes. 2. Add the oregano, thyme, and chili powder, and fry for 30 seconds. Add the beer to deglaze the pan. 3. Add the broth or water, salt, and the squash. Bring to a boil, and then reduce to a simmer for 10 minutes. 4. Meanwhile, mix together the dumplings: Add all of the dry ingredients to a large bowl. Use your fingers or a pastry cutter to blend in the margarine until there are no large chunks. Stir in the soy milk, and set the dumplings aside for 5-10 minutes. 5. Add the chopped swiss chard, beans, tomatoes, cilantro, and lime to the stew. Return the pot to a stead simmer over medium-low heat. 6. 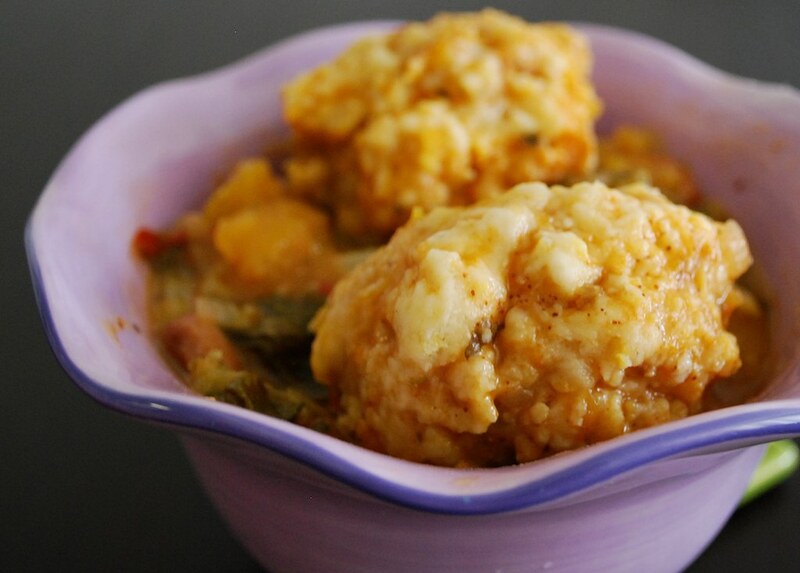 With wet hands, form the dumplings into ping-pong sized balls, and drop each ball on top of the simmering stew. Cover the pot and let it cook undisturbed for 20 minutes, or until the dumplings are puffed up and cooked through. 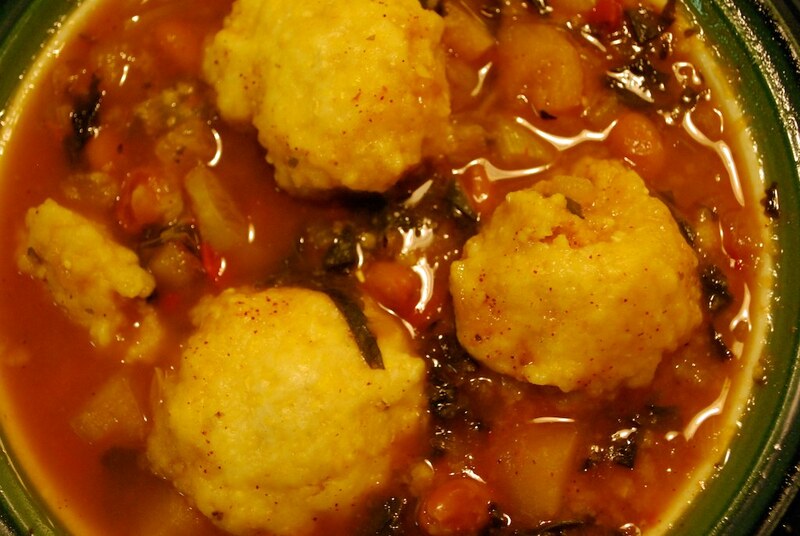 Ladle stew and dumplings into bowls and serve it hot. Note: If your stock pot is not very wide, you may want to cut the dumpling recipe in half so that they do not crowd the pot. They puff up quite a bit as they steam. I really like the dumplings, so this makes a lot of dumpling as written. This entry was posted in entree, soup and tagged butternut squash, cornmeal dumpling, pinto beans, recipe, swiss chard, vegan. Bookmark the permalink. I totally know what you mean about the kitchen being therapeutic! That’s how I got the name of my blog 🙂 Wonderful looking soup, Leila. Perfect for the change in season. Thanks, Roxan! I love the name of your blog. 🙂 Cooking really does have a meditative quality to it. As long as your not a Hell’s Kitchen contestant or something, I guess. The dumplings are a great idea!! This looks fabulous! What a creative mixture of flavors! Hope you are staying safe & dry on the Cape in all this snow and rain! I don’t have very much experience with gluten-free baking, but I think this recipe would work. You can definitely substitute the beer with a gluten-free beer or just additional vegetable broth–that would be no problem at all. For the dumplings, I would start by subbing the all purpose flour with a gluten-free baking mix. I think that you could use a little garbanzo flour (maybe a few tablespoons?) to encourage the mixture to gel/thicken without the help of gluten. I would then substitute the balance of the AP flour with the same type of GF baking mix here that you would use in a muffin, quick bread, or cookie. I hope you try it. If you do, please let us know how it works!